Instruction card for Sega SOUTH PARK pinball machine. 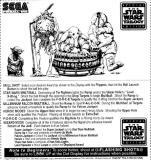 Instruction card for Sega STAR WARS TRILOGY. Sega APOLLO 13 instruction card on glossy card stock. VIPER NIGHT DRIVIN (Sega) Card Instruct. Instruction card for Sega VIPER NIGHT DRIVIN'. Instruction card for Sega X-FILES. Instruction card for Stern HARLEY DAVIDSON 2nd edition pinball machine.